When you are Walking, Jogging ,Running, Pet Walking, Hiking, Camping ,Cycling, Horseback Riding or Motorcycling in Early Morning or Evening, Your Safety and High Visibility is important. Glovion LED Sport Armband uses the built-in optic fiber LED light to light up armband, rather than rely on normal reflective armband to create visibility. With 3 different lighting settings, on and intermittent 2 speeds, rechargeable via USB (Micro USB Cable included) to ensure the maximum visibility. And get spotted and stay safe in the dark for your activities. Each full charging can illuminate approx 5-10 hours according different lighting settings , take approx. 2 hours to charge with the supplied micro USB by universal 5V USB outputs. Our armband fix most, but if you have special requirement for size , as the factory-based seller ,just contact us ,we can customize it one for you . 100% customer satisfaction is guaranteed, if you are not satisfied for any reason with your purchase, please contact with us directly, we’ll work with you until you are satisfied. ?BE SEEN FOR SAFETY : LED Running Armband can bring high visibility to drivers or motorists for your personal safety in the dark situations (Early Morning or Evening).
? USB RECHARGEABLE: Built-in rechargeable battery, eco -friendly for recycle using . No More buying and replace batteries , Save your money ! 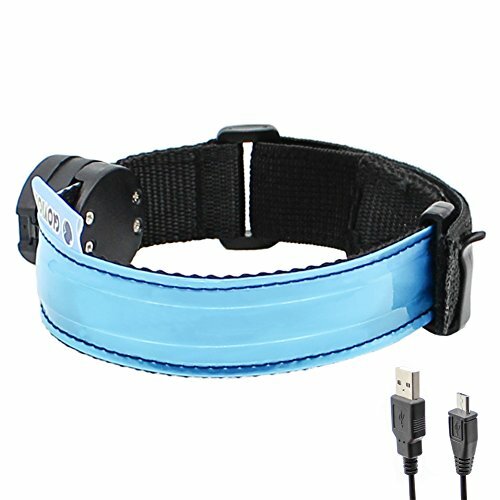 USB Rechargeable Armband pack with a micro USB Cable for charging.
? 3 LIGHTING SETTING OPTIONALS :Sport armband light with Constant, Quick Flash and Slow Flash for your different situation ,just 1-click to control it . Easy to operate it. ?VERSATILITY &APPLICABILITY : One size fit most ,widely used or Walking, jogging Running, Hiking, Cycling, Horseback Riding or Motorcycling. ?BUYING WITH CONFIDENCE: One year replacement for defective units ,30 days no-hassle refund & replacement ,our customer service team will provide you friendly and proactive customer service with no-hassle lifetime guarantee!